International Fare. Farmers' Market Fresh. That's the tag line for Robin's Restaurant in Cambria. The ever so charming Robins Restaurant is located in a restored adobe home in the historic East Village of Cambria. Just off the main drag this locals favorite has a very diverse menu. 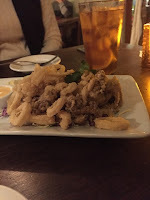 They describe it as handcrafted comfort cuisine with an array of international flavors made from farmers' market fresh ingredients. The international fare part is very much the case. One look at the menu and we were almost lost on what to order. From steak, to curries from Malaysia and India, to Jerk spiced Duck breast and wild prawn enchiladas. The term eclectic comes to mind. The place was jumping on this Sunday night and everyone seemed to be enjoying the food. There were many noticed occurrences of "here take a bite, this is amazing". 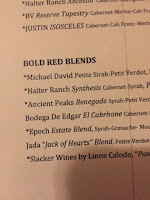 There are a nice selection of wines to pair with this variety of food with as well as a decent by the glass selection. As mentioned already the place was jumping but the service was still on point and we felt well taken care of. 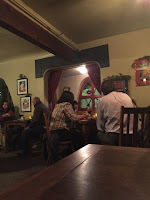 Inside is where we were seated and the warm cozy feel with some interesting décor made us feel very comfortable. 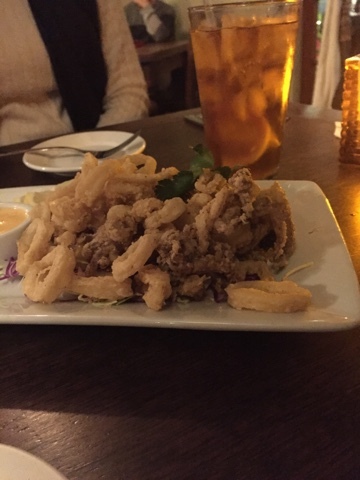 We started with some delicious calamari. Perfectly cooked and it came with a lovely flavorful aioli. 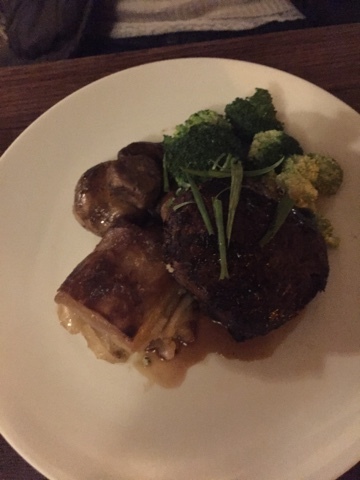 For mains we ordered the 8 oz Chateau Top Sirloin scalloped potatoes, broccoli, roasted mushrooms with burgundy wine sauce and the Half Roasted Jidori Chicken baked with cauliflower, capers, bacon, pecorino, swiss chard and roasted chicken demi. 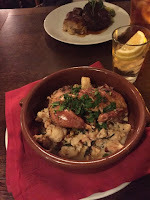 Both meals were delicious but the Chicken was simply amazing. Some of the best chicken we have ever had. For dessert we had a decadent chocolate cake that was so wonderfully rich it could pay off the national debt as well as a delightful bread pudding. 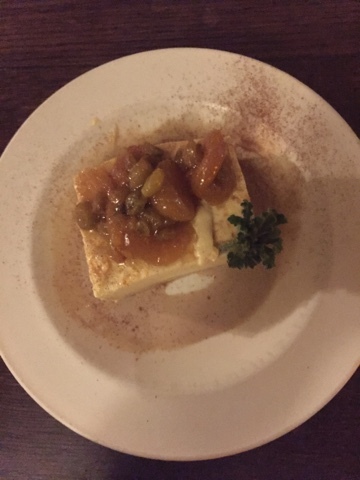 A lovely evening at a lovely restaurant with a great meal. 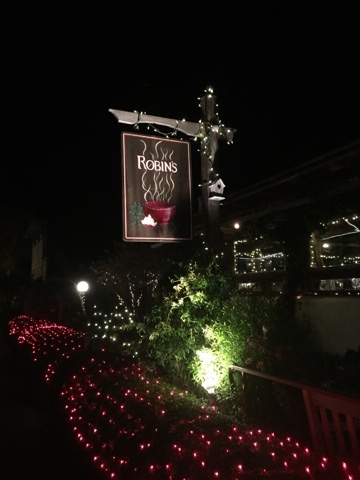 Its no wonder Robin's Restaurant has been Voted several times as "Best North Coast Restaurant" by the San Luis Obispo New Times' "Best of SLO County" reader's poll. We can see why. If you are near to Cambria we highly 'recommed' you eat here. 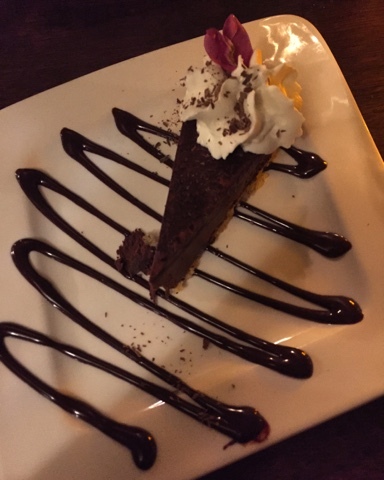 We would like to thank Karen from Cutruzzola for hooking us up with Robin's Restaurant and to owner Shanny Covey for hosting us. 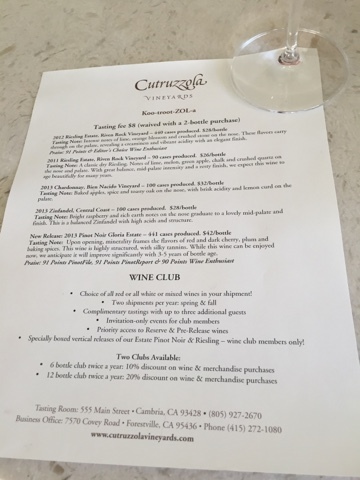 Why go wine tasting in Cambria? 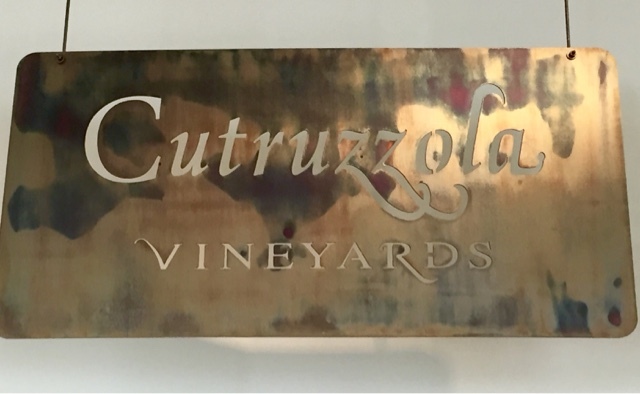 Cutruzzola Vineyards. Few places do a worthy Riesling. This is one of them. Who knew that in Cambria, the lovely coastal town on one of the many central coasts in California, there was to be had a couple worth the visit Rieslings. 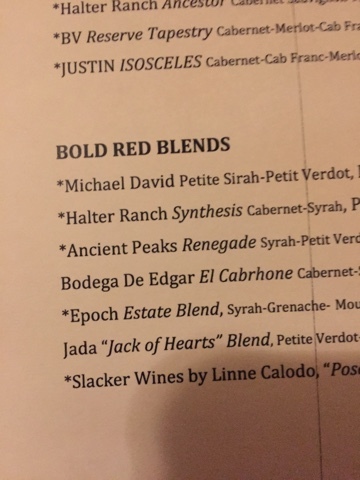 Now this is not to say that there are not a host of other great reasons to visit here, but when we get invited to try wine and its in a place we enjoy visiting, there is no stopping us. 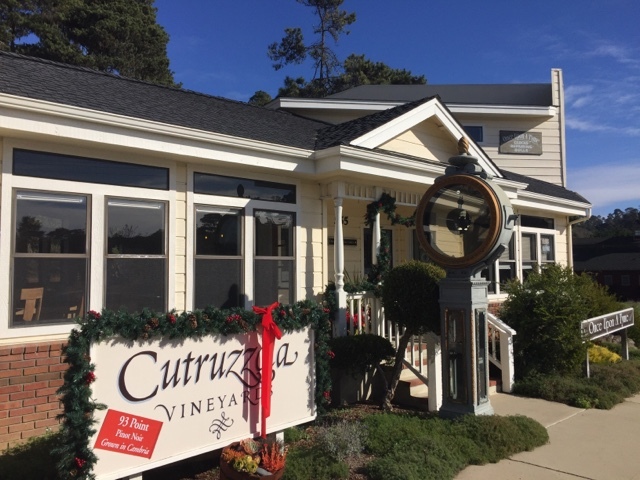 Not sure how we missed the tasting room of Cutruzzola Vineyards in Cambria the last couple times we were in town. So with the destination plugged into the GPS it was off to taste some wine from a winery that we had never tasted before. We arrived and were even more surprised we had not been here before as the tasting room is not to be missed right by the northern main entrances to the main street of Cambria. 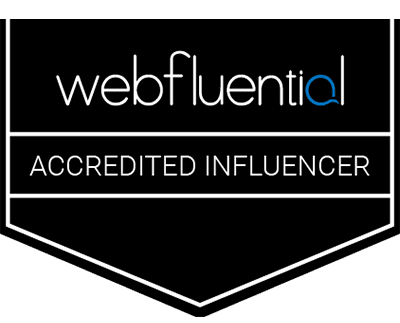 We went in and formally introduced ourselves to the Director of Marketing and Operations, Karen Warfield, who had reached out to us through social media. What a lovely bright and warm feeling tasting room with a nice tasting bar and a really cool big table for special tastings or any number of other great options. After a quick get to know each other chat it was on to the business of tasting wine. First up was the 2012 RIESLING • RIVEN ROCK VINEYARD SAN LUIS OBISPO COUNTY; With lovely enticing notes of orange, lime, orange blossom and just a hint of freshly opened tennis balls. These flavors carry through on the palate with the added flavors of melon and pear. There is a lovely light fresh sweetness that compliments a nice mouth feel, balanced acidity and a nice elegant finish. For those that like their Riesling with a touch of sweetness (3%), this is a cracker. Next up the 2011 RIESLING • RIVEN ROCK VINEYARD SAN LUIS OBISPO COUNTY; What a lovely lemon curd, lime and honeydew melon coming through on the engaging nose of this off-dry wine. Again what you smell carries through onto the palate. Although it has a slightly fruit sweet taste it is only 1% residual sugar. It is a full flavored and intriguing wine that engages the palate with citrus peel, grapefruit, squeezed oranges and some nice minerality with a lovely mouth watering acidity that has you going back for more. After the Rieslings the 2013 PINOT NOIR • GLORIA SAN LUIS OBISPO COUNTY was up; A nice dark cherry nose with some rose petals tossed in. The flavors that stood out were of red and dark cherry, plum and a little spice. This wine is nicely balanced and shows good structure with silky tannins and a medium finish. A lovely drinking Pinot Noir that will only get better over the next few years. We were also poured a lovely Chardonnay and a soft well balanced Zinfandel. We focused here on the Rieslings and the Pinot Noir because they are from the estate vineyards located just outside of Cambria, only a few miles from the Pacific ocean, and just over the coastal mountains from the Westside Paso Robles wine region. Thanks to Karen for reaching out to us and the invitation to share some very lovely wines. 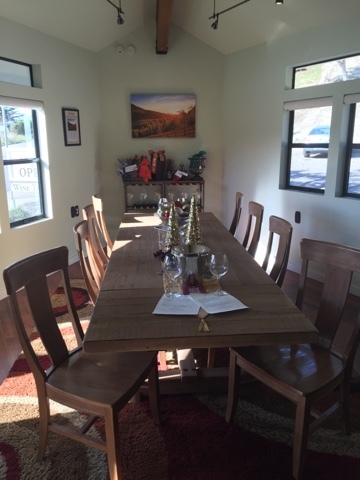 The Cutruzzola Vineyards tasting room is one you 'must do' when in the Cambria area. 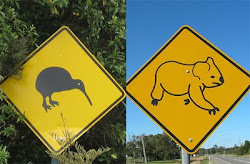 They are also part of the Pacific Coast Wine Trail. A collection of ten wineries from the Rock in Morro Bay to Hearst Castle in San Simeon, with stops in between at Cayucos, Cambria, and Harmony, the Trail offers travelers a wine experience as unique as the coastal communities themselves. Go check 'em out and don't miss Cutruzzola.